Now I'll go in hiding to avoid spoilers! 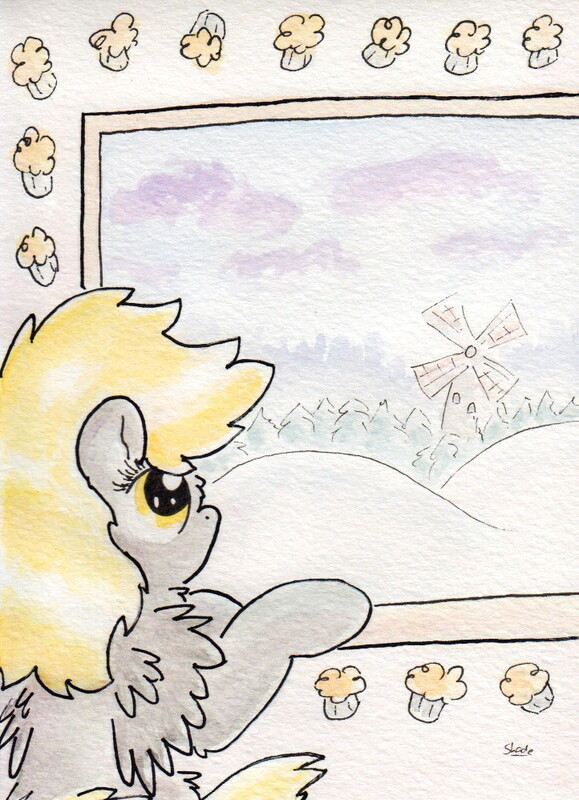 looks like she is waiting for somepony to bring her to the windmill. maybe dinky could help out hehe. Some spoilers inevitably get to me though; I had seen two Scootaloo gifs, so, I knew some things. But yes.. what an episode. I hope to do it justice with some worthwhile art. it's possible I remember in show stoppers when the crusaders finished there song rarity and apple jack came to greet there sisters and dash came for scoots. so the seeds of scootadash where there, but this is solid unbreakable proof scootadash is as real as rarity & spike. and while in show its all buddy buddy and not lovey dovey, what happens when the camera's are off is another story lol. sorry to hear your painting didn't turn out as you'd hoped. but your very good at what you do I'm sure with a bit more time you'll get the painting the way you want it to be. It doesn't work like that. I can't go back and fix it - almost every mistake is final. That's where I envy digital artists. The advantage to working like this is that you do develop the ability to be fearless and minimize mistakes. It's a good confidence booster. Unfortunately sometimes these things sneak up on you. I got a better composition in a similar 're-take' though - I'll probably paint that later. It's some more Scootadash. I feel like all these different takes on their relationship are based on the same root affections. How they express that and how far they take it is up to our interpretation. I like how they handle it in the show; it explores the root of their connection and develops it without spelling out every aspect. It doesn't kill the need for imagination. I personally think you could see how much they like each other in every episode - save Mare Do Well, which is a simply terrible episode - it really told you how it was going to be. This episode's plot reminded me of my fan fiction, even, and that should tell you something about the season 1 established writing. oh no no I didn't mean on the same canvas you made the mistakes on. i meant like take that idea to a new canvas and work from your mistakes, sorry should of been more clear. I do traditional paper work i know what ya mean digital artists have the best of luck fixing there errors. I've had a few I get to inking and realize I made an error and its like welp back to doing it all over. you do bring up a good point with there interactions they have always seemed to have a good connection. tho i'm sure ponyville confidential was a sore spot in that relation too when she realized scoots had printed dirt on her (and sweetie and bloom). tho they really have not given the both a lot of screen time together before so with this and showstoppers it does give a good sense of there relationship. one can only hope that with this they show more scoots and dash even if just a background shot for up coming episodes. and yes you fic was pretty spot on minus the giant owls wanting to eat them lol. Ah, yeah! Well, now it makes sense! It's just weird that I went all the way through the painting phase. Oh well! I got this one sorted now; it's great to have a basic idea 'n mood out of the system in a satisfying way! yeah and everyone learned a lesson. anytime tiara is involved things will not end well lol. but your right the closer they are the more it hurts when they betray your trust, and ponyville has that small town feel so everyones a close friend there. And some are closer than others! Now they're super close! But they wanted to be super close before, obviously. Aww. Those ponies! Was this a tiny derp appearance or something more visible that I missed? Two tiny appearances.. well, I actually believe she showed up twice in the same scene in Magic Duel, so that'd be three. She cloned herself, though it might've been Trixie!